This award-winning, NIV-based, verse-by-verse commentary has been revised to reflect current evangelical scholarship, theological discussions, and critical issues. Each book includes comprehensive introductions, detailed outlines, insightful exposition of passages and verses, and short, precise bibliographies. Each contributor is committed to the divine inspiration, complete trustworthiness, and full authority of the Bible. This volume is based on the NIV version, and wherever specific biblical words are discussed, the Goodrick-Kohlenberger (G/K) numbers have been added. Verlyn D. Verbrugge (PhD, University of Notre Dame) served as senior editor-at-large for biblical and theological resources at Zondervan until his death in 2015. He published a number of articles and was general editor of the acclaimed New International Dictionary of New Testament Theology, Abridged Edition. He is the author of several books, including Paul and Money and A Not-So-Silent-Night. 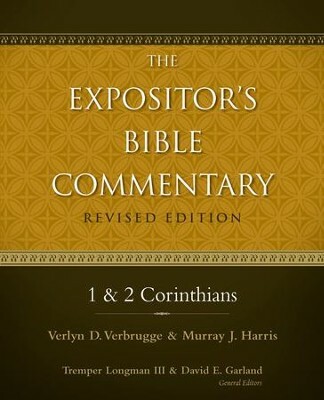 Continuing a Gold Medallion Award-winning legacy, this completely revised edition of The Expositors Bible Commentary series puts world-class biblical scholarship in your hands. Based on the original twelve-volume set that has become a staple in college and seminary libraries and pastors studies worldwide, this new thirteen-volume edition marshals the most current evangelical scholarship and resources. I'm the author/artist and I want to review 1 and 2 Corinthians / Revised - eBook.